If it weren't for G.I.JOE, I wouldn't be working in comics…and possibly not even reading them. Such a profound impact it had on my youthful life growing up! Marvel's Joe comics were the first comics I ever bought and read on a regular basis. It was the '80s and I was in grade school. I'd rush home every day to catch the cartoon, and those beautiful 5-part episodic mini-series events. I was captivated by the toys. And they even ran animated commercials back in the day advertising reading the comic. I'd buy those comics from drugstore spinner racks and magazine shops, back when those were a thing. The monthly wait for each issue was excruciating, stopping by each week to see if the new issue came in. And through a friend, I was introduced to a local shop that sold nothing but comics. A way to dig through the back issue bins and get caught up on issues I had missed. Comics nirvana! 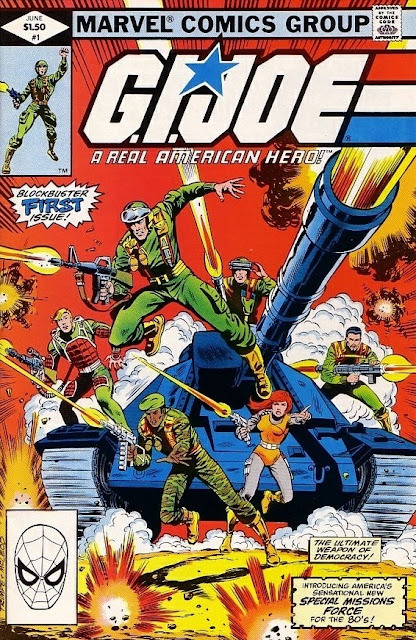 I remember proclaiming quite profoundly that G.I.JOE (and Transformers) were the only comics I'd need. They seemed "realistic" enough for my tastes. No need bothering with any of those spandex superheroes in tights and capes. Of course, that would change, and I'd get hooked on plenty of Marvel, DC, and Image books throughout the years. But those Joes were my first. It was Larry Hama's writing, those beautiful Mike Zeck covers, and the multiple artists that had runs on the book. The backstories for Snake Eyes and Storm Shadow. The Silent Issue. The characters that died, some that came back and others that didn't. Heroes and villains and patriotism and freedom. And eventually, the title ended at Marvel and that would be it. After high school, college, and art school, I'd find myself working in the industry that meant so much as I was growing up. And the Joes came back, published by a few companies. But it was Hama's Joes that would always be my version. So it was a pleasant surprise when IDW got the license and picked back up again with Larry writing his Joes. I was happy it was back. And even more enthused to drop them a line, checking in from time to time, if they ever had an opening to work on it. And with the multi-part "Cobra World Order", I'd get my shot. In the back of my mind, I always thought it would be one of those full circle moments if I ever got to work on a Joe comic…and it totally is! But I never would've thought it would be on a Hama Joe comic. The comic that at one time was cancelled. The writer and staff having moved on. But now my 30 year journey has arrived with my name credited on the cover underneath the writer whose stories gave me so much entertainment, inspiration, and now a career. I've gotten the chance to ink four issues for this story. And hope to do more in the future. 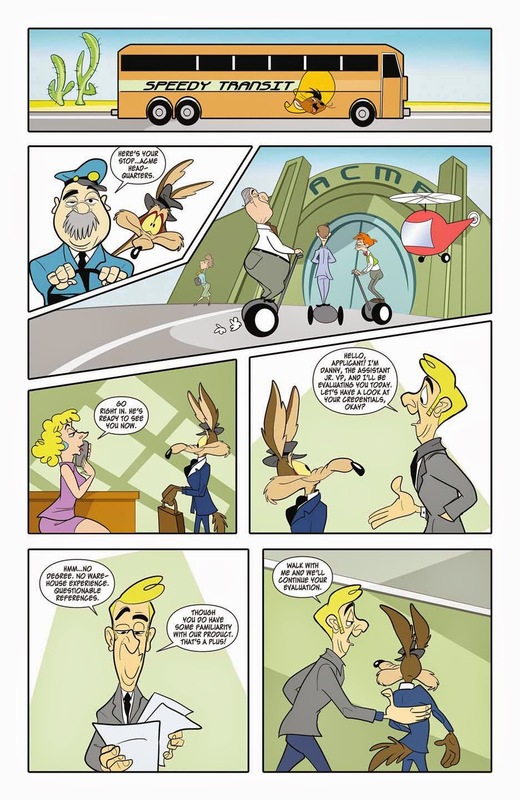 In addition to drawing some covers recently on DC's Looney Tunes comic, I also got the chance to write a story. All those years of waking up at the crack of dawn and watching the show on a Saturday morning sugar cereal high, finally have paid off. I pitched a number of different story ideas, but truth be told, DC and WB picked the one I was most interested in doing. 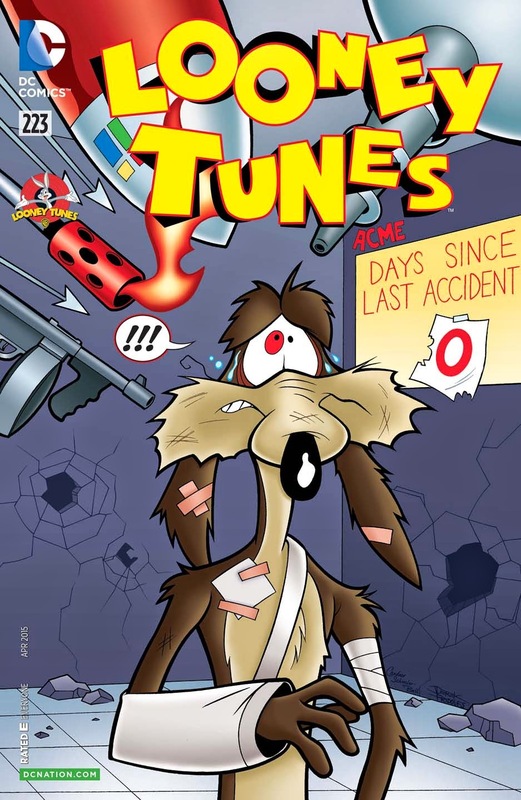 Such a huge love for all those great Coyote and Roadrunner cartoons, it was a blast to do my own. First things first, the cover. Unlike previous covers where they like to see three or more ideas to pick from, I already had a strong idea of what I wanted to do. So with the layout in mind, it was more a manner of trying to find the right expression for Coyote to have. Because it's as much about getting it cleared through WB standards as it is DC. Also why I have the greatest amount of respect for the animators and sequential artists that work on cartoon licensed books. They have to draw these characters "in movement" across the screen or page, multiple times, from multiple angles and situations. Something I'm not entirely comfortable doing. But a one-image cover, I'm always striving to see if I can accomplish that. For the story itself, it's always a matter of respecting the property. Trying to have an understanding of what's come before and the tropes of the universe it inhabits. So on animation based properties, I always sit down and watch a lot of them and take notes. Break down what works and what doesn't. And it'll always spark the imagination. 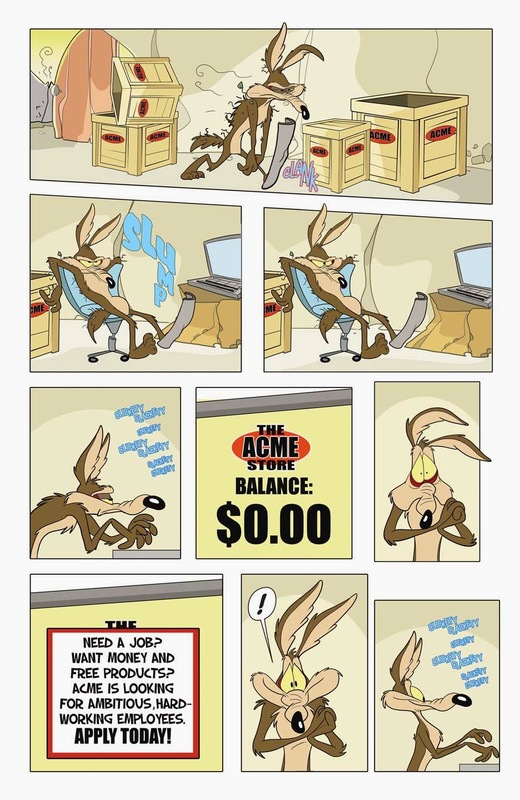 With ACME such a prevailing part of every Roadrunner cartoon, it was pretty easy coming up with a story that involves Coyote running out of funds and going to work for ACME in order to get more items to use in his never ending quest to get the Roadrunner. It was fun playing around with the idea of ACME being sort of another high-tech version of Amazon or Google. The one sight gag I wanted to put early in the story, and I wasn't sure if it would even be allowed, was to have Coyote and Ralph Wolf pass each other in the same panel. I couldn't for the life of me remember if they'd ever been shown together before. But I liked the idea of finally putting to rest any question that they were the same character (Coyote with his black nose and Wolf with his red one). When I found out that Dave Alvarez would be drawing my story, I was very excited! I'd followed his work before on his own creation "Yenny", as well as other stories he's drawn for Looney Tunes and Scooby. He's always had a way of faithfully capturing the style of the animation property he's drawing, while making it come to life in his own fun way. And I think the art he did here looks like a lost episode from the show. So clean. Tightly drawn, with solid colors by Candace Schinzler-Bell. Hope to get the chance to work with them again! Apologies as I've been absent from posting much here. I'm in an interesting transition period of work. Have wrapped up most of my inking commitments. Writing various short stories and special issues for a range of places (drawing a few of them too). And venturing into the Children's Book Market for the first time as I'm in the early stages of working on what will be a huge publicized project in the coming years. Equal parts daunting and exciting. And another phase of work is getting the chance to draw covers, which I always consider another form of "storytelling"…just with less space involved. The career I'm stumbling through to chisel out, I never expected to work on covers. Or even draw sequentials. I was pretty comfortable just inking for a long stretch of it. But eventually you want to try different things. Opportunities surface. And you're just sort of happy for the chance. Working on Looney Tunes has been pretty exciting. It doesn't seem that long ago (although it's been 25 to 30 years in the past) that I was waking up at the crack of dawn on Saturday mornings, getting hopped up on sugary cereal, and lying on the floor to watch hours of cartoons. 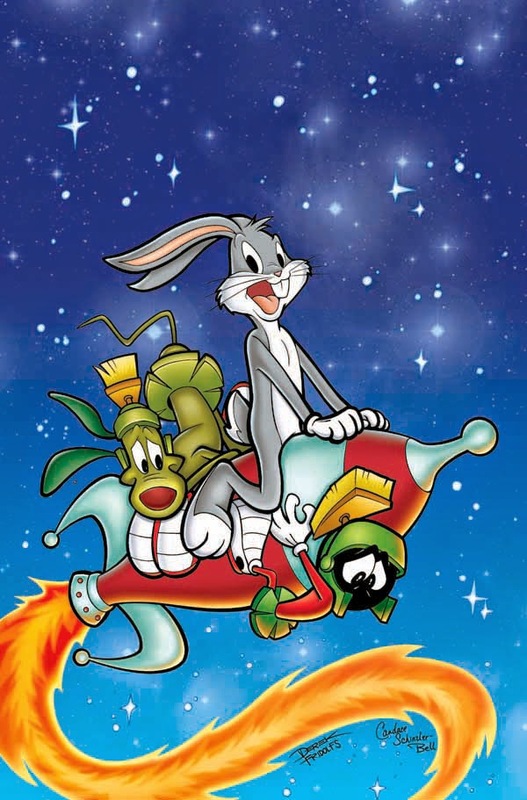 Of those, repeats of those great classic Looney Tunes were part of that experience. Now all these years later, working with one of my editors on Batman Li'l Gotham, I'm fortunate to draw some covers for the Looney Tunes comic that DC is still putting out. Drawing such recognizable animated characters is probably the greatest challenge. Unlike most comics where companies (and fans) are interested in an artist's distinct style, it's much different for cartoons (and cartoon based comics). The artist isn't the star attraction, the character and their design is. And being focused to draw them as close to "on model" as you can is the most important part. For a couple of years before I got into comics, I was in art school specifically to get into animation. Character animation, inbetweening, clean-up, storyboarding; and shopping my portfolio around animation studios. And even though comics always was the bug that bit me first, I've always enjoyed animated material. But it's also tough to try to fit into that style on a consistent basis. But doing covers is a little easier than drawing or animating these characters more sequentially or frequently. Below are some of my thumbnail ideas for this cover. Covers usually happen one of two ways. You either just randomly draw whatever you feel like and it doesn't have to relate to the story. Or you get the script and come up with ideas around it. This was sort of a mix of both. I got to read the script, and drew some space themed ideas, even though the cover scene never specifically happens in the story itself. Still it's a fun exercise to try to capture a theme in one image that will make the reader want to buy the comic. I have another cover I'm doing for the comic as well as writing the story for it too. But I'll cover that (no pun intended) in a future post. Just like all science experiments, there are steps involved in order to create. It's no different here, bringing back a beloved cartoon to comics. 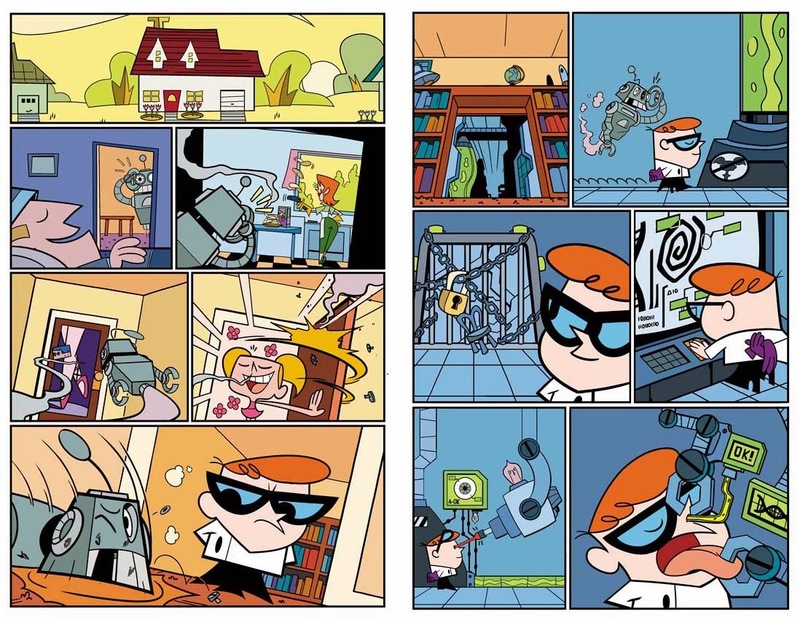 So here are six steps involved in creating the new DEXTER'S LABORATORY comic at IDW . . . It's always better to be asked than to ask. I've tried pitching for various titles and companies in the past. Cold call submissions. You might know someone at a company, or sometimes not at all. But you're hopeful your resume of past work will help them consider you, so you contact them first. For the most part, it generally never works that often. Pitches get turned down for any number of reasons (similar projects in the pipeline, they're not looking, or they just flat out hate the idea). But when a company comes to you, you at least know they're interested in the project, and more importantly, in you. 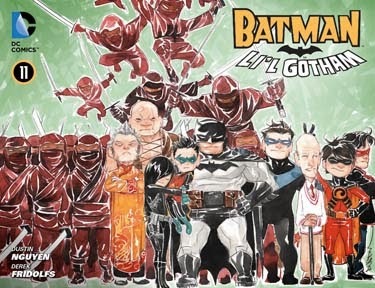 I was approached by Sarah Gaydos, who had previously edited me on Batman Li'l Gotham at DC. 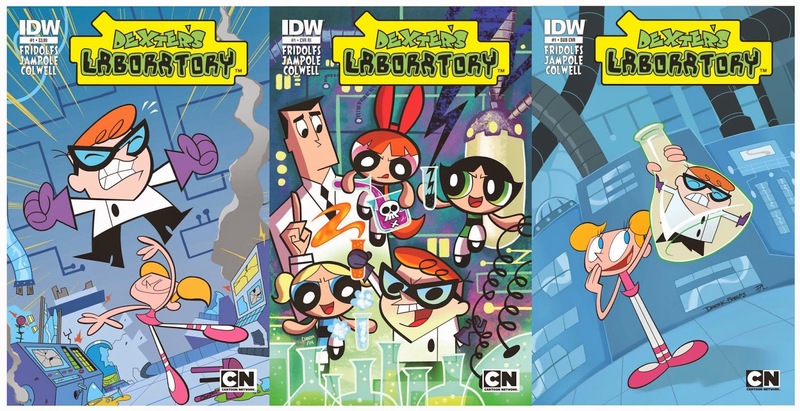 Now that she was at IDW and in charge of the Cartoon Network line of kids book, she asked if I'd be interested in pitching for Dexter's Laboratory. It was a show I fondly remembered when it came out during my latter years in college before I graduated. 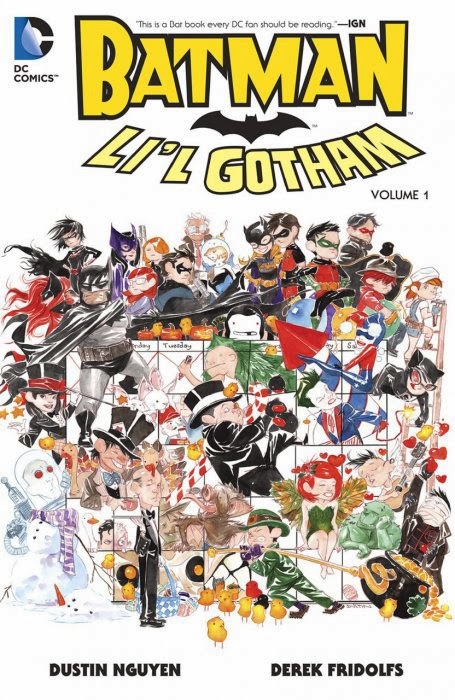 I loved the humor, and felt this would be an ideal follow-up to the fun stories I helped write in Li'l Gotham. Pitching is just like a job interview. You have a resume of past work and connections that can get your foot in the door. But it really comes down to presenting yourself (your idea) as best you can and just hope that they like it. Add to that, that you're not the only one pitching. You assume, and rightfully so, that others were asked to present their ideas as well. So you're in competition with others as well as yourself, right out the gate. Putting your best foot forward and coming up with the idea itself can be the most nerve wracking part of the process. There is one thing that has always ruined every experiment Dexter has ever created…his sister, Dee Dee. 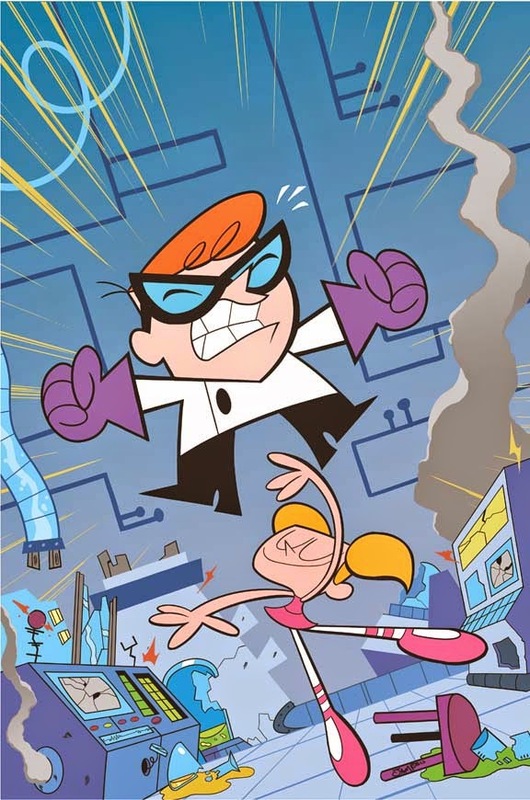 Realizing the only way to ever succeed is by removing this error from the equation, Dexter believes he's created the perfect world in which to reach his ultimate potential. Instead, his dream becomes a nightmare once he realizes he needs Dee Dee, and will go to the end of the world to bring her back. As the case is with pitching, sometimes you hear back but usually not at all. You cast away, hope for the best, and move on. I can't recall if it had been weeks or months when I heard back, but I was out of town and checking my email on my phone when I got the word that Cartoon Network liked the story and greenlighted it! Before I could celebrate, it was time to start drafting up the outlines to each issue, and get the ball rolling. There are actually a few steps for the process of writing comics. For me, it's turning in an outline for each issue (generally a page or two long that plays out the various beats and ideas for the issue). There's writing the scripts themselves (I always write full script…breaking down every page and panel with description and dialogue). Writing is rewriting, so once you get notes back from the editor and the licensor, it usually only takes one more draft to turn in. And towards the end of the process after all the art and lettering is done, is the proof stage. To see how it looks and turn in any last minute notes (usually to add or take out dialogue as the case may be). For Dexter, the scripts came pretty easy. A lot is watching enough episodes to get a feel for how the show writers helped give voice to the characters. I always try to remain as true to the show as I can. I want to hear the actors in my head when scripting them for the comics. It's the best compliment to get when someone reads the comic and says it reads like the show or they hear the actors. And you always hear horror stories of various networks asking for lots of changes and being tough to work with. But Cartoon Network has been very easy. I noticed that when writing the Adventure Time comics and it was no different on the Dexter's Lab comics. Knowing that IDW publishes multiple covers for each issue of their comics, I wanted to see if I could draw one (especially for a title I'd be writing). So it was agreed I'd do one for the very first issue. 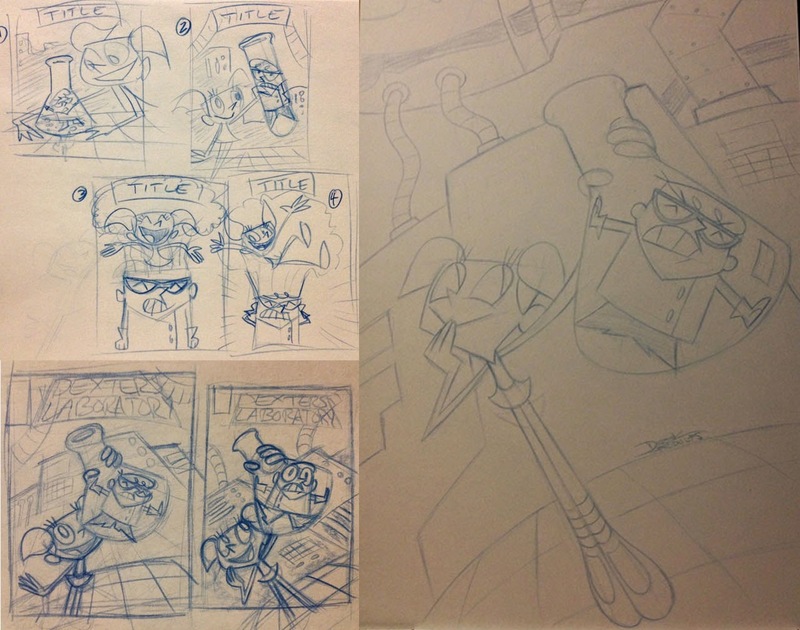 From this point, it was a matter of drawing up some thumbnail ideas for what the cover might look like. And the idea for what would become my cover, came while sitting in traffic. Stuck on the 405 in LA, bumper to bumper, I had a notepad in my passenger seat. And when the idea of Dexter stuck in a tube held by Dee Dee in his lab popped into my mind…I drew up a rough sketch. I later revised it into a few different designs. Once approved by Cartoon Network and IDW, I went about drawing it up in blue pencil, then ink, then passed it along to the colorist, Pamela Lovas. Aside from web comics and convention prints, this is her first professional published work that I know of, and I think she did a fantastic job. Actually added so much more to my very basic idea. And I've worked with her again on an upcoming Adventure Time story. Not every project I'm on, do I get to see the rough pencils before the art is finished. A lot of time, books are already under tight deadlines, and the writer doesn't see anything until the proofing stage (and sometimes not even then). 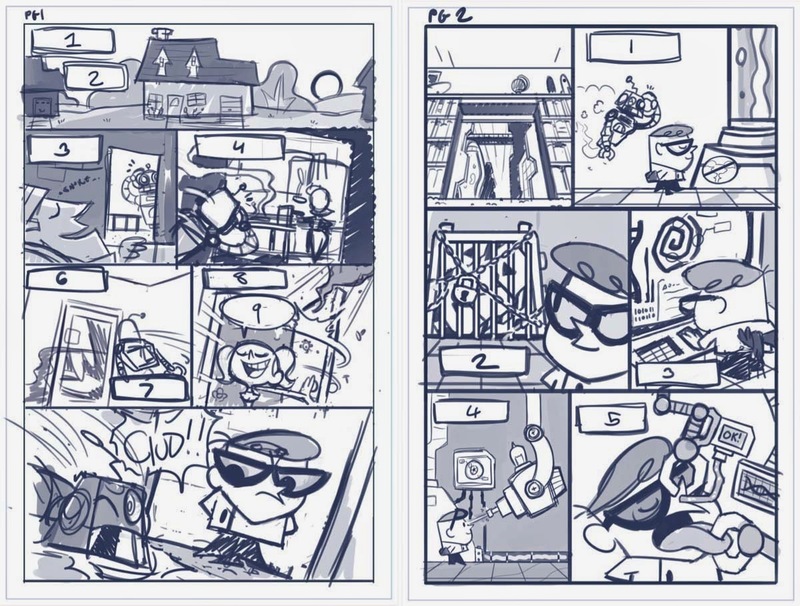 But we were on schedule or ahead of it, that I'd get sent some of the rough layouts by artist Ryan Jampole. And even at this stage I was excited, because his roughs looked on-model and clean. I could already imagine what the finished art would look like! Ryan Jampole on pencils & inks. Jeremy Colwell on colors. I'm not sure how close they worked together, but I think they blend together extremely well. The cartoon is heavily centered around blues and greens. And sometimes, that might get drab or come across flat on the comic page. But I think a nice balance has been reached. To the point that the art looks so close to the animation cels from the show. And the final step….you the audience! The first issue, in all its covers, hits stands today. And I'm hopeful that new and old fans will like it. And I'd love to hear from ya. Feel free to comment. 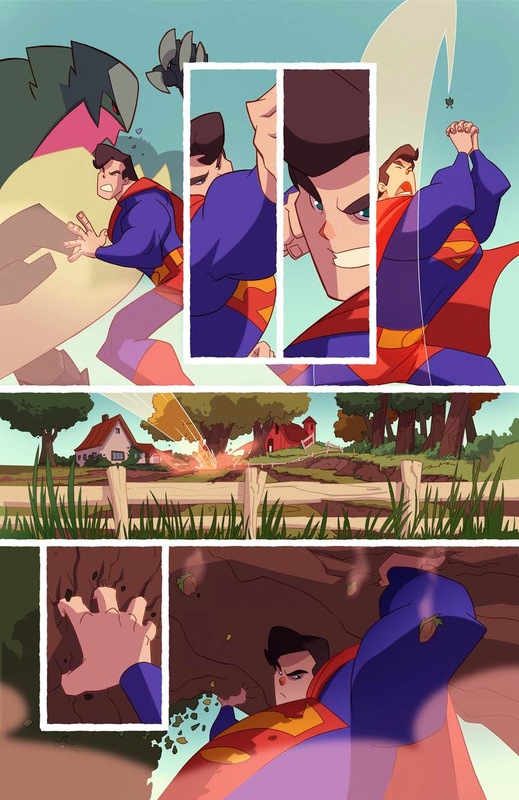 Superman is one of those characters you never think you'll get a chance to work on. Arguably THE #1 recognizable superhero and trademark for the industry. The cape, bright colors…truth, justice, and the American way. 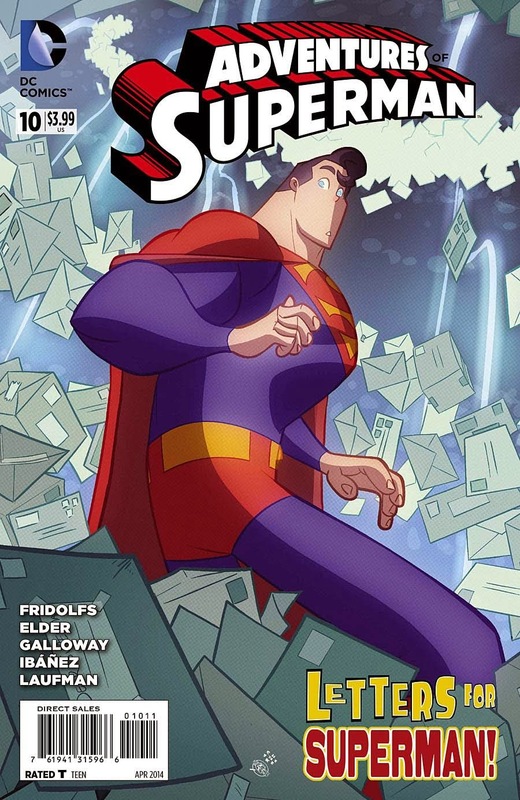 And when the DC Digital First "Adventures Of Superman" title was announced as an out-of-continuity anthology where creators could put their stamp on the character, it would provide an opportunity to do a story that might be a little old fashioned. One that wasn't tied into the current look or feel for the character at the company. And one I couldn't wait to tackle. The longer I work in comics, the more I see the chances to work on some of these icons as fleeting. The directions for these characters, their titles, and their creators, all get set up many months if not years in advance. Very few spots become available and very few fill-ins anymore. So when you do get to tell a story with them, you really feel like this might be the only chance you'll get. You really feel the pressure of the "kitchen sink"approach. That you better have a great story to tell and put in everything you want to say about that character, because you might never have another chance. And that's really the approach I took with my story. Everyone has their favorite version of Superman, whether it's the film interpretation by Christopher Reeve or the era of the comic they first started to read. My approach was more animated. I loved both the Fleisher era and the Timm/Dini/Burnett show that also drew from it. I wanted to include all the classic tropes…The Daily Planet, Lois not knowing Clark's secret identity, Jimmy Olsen, Lex Luthor and Brainiac cameos, Superman put in an unenviable position with a life on the line and no easy answer, and of course, the underwear on the outside. I wanted to split the time in Metropolis as well as a rural small town farm community. And I had to find space for it all in 20 pages. I don't remember exactly how I landed on the idea of "Letters To Superman". Just that it's probably been done in the Superman comics of the past, as well as for other characters. And it provides for an interesting story angle. For Clark to step outside of his Superman persona for a brief moment and see how others view him. It's something I've recently experienced myself from time-to-time when DC will forward some letters from school students to me asking questions or sending along their words of appreciation. You get so used to sitting in front of the computer or art table, alone in a room, working on comics by yourself; that it's nice to get a handwritten or typed letter from someone you've reached with your work and realize there are people out there enjoying it. One thing that surprised me after my story came out was a comparison to the "Man Of Steel" film. One even pointed out that it might've been in direct opposition to it. That the movie had all sorts of collateral damage by keeping the battle in the city and lives lost, while my story took the fight out of the city and into the farmland. To keep any casualties to a minimum. And my enemy wasn't killed at the end but saved through other means. Of course, none of this was on purpose or some kind of statement on my part. I had no idea at the time of writing my story how it might be compared to a film that hadn't come out yet. I had turned in my script at the start of 2013, and a film I didn't know the full details about wouldn't get released until that summer. And while I prefer a more throwback approach to the character in my story, I still am a big fan of the "Man Of Steel" version as well. I think Superman is a large enough character (much like Batman) that I appreciate all variations and that there's room for various interpretations. But the most amount of fun I had working on this was with my good friend Sean "Cheeks" Galloway on art. I met Sean online waaaaay back before he had broken into the industry. And seeing him rise through the ranks of comics and animation has been a fun journey to witness. As someone who has his own studio of creators working for him at Table Taffy, I wasn't sure how busy he was. So it was perfect timing that he was able to fit this story into his workload. I knew since we both grew up at the same time and have similar interests, that this would be a story he'd enjoy working on and geared to a more all-ages mindset. And he'd be able to give it that sort of cartoon cel shaded style that he's known for (having been the designer on the Spectacular Spider-Man show and Hellboy Animated films). And you'll be seeing more from us in the future as well, as I've written for some of his Kickstarter created projects. 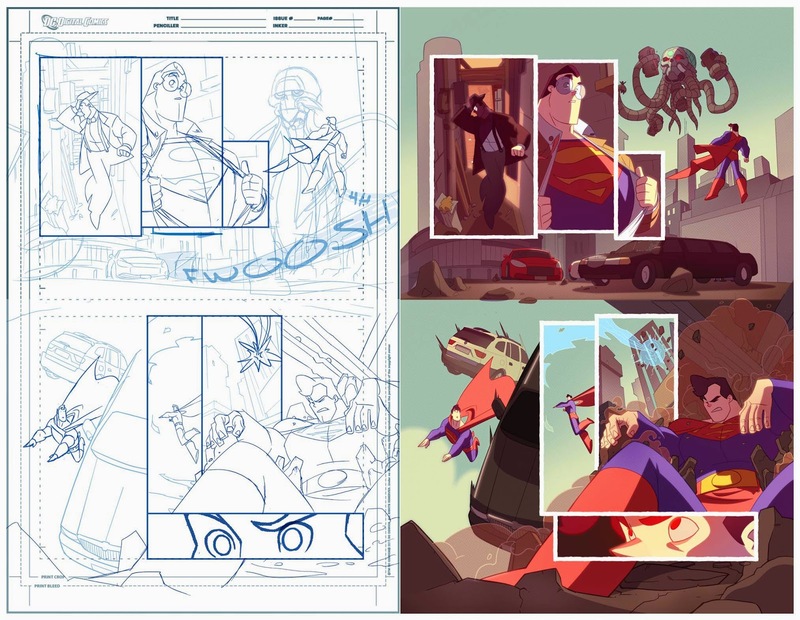 Layouts and finished color art by "Cheeks"
It's been a little hectic around these parts as I've been juggling all sorts of jobs lately the last few months. Writing in comics and the computer game industry, back to inking fairly regularly again, and also found the time to draw an upcoming short story as well. Whew! But in the end, I've been neglecting to keep things updated here on this blog. Going to see if I can change that and update things a little more frequently. Batman Li'l Gotham finally concluded what became an insanely fun ride. What started as Dustin pitching chibi characters for a line of snow globes, turned into a couple short backups in the Batman Annuals, and eventually to a full blown digital and print series. Out of all the projects I've written, it might've been one of the easiest to write for. Dustin always had the tough task of having to draw and paint it all on a tight schedule that never let up. But I got to kick back, brainstorm with him, and come up with some of the silliest ideas…and it somehow just clicked. Very little in the way of rewrites. Most of the stories were set to run as-is, which is a huge blessing in this industry. For the very last Li'l Gotham story, I'd had the spark of an idea very early on. I think early in our run after the book had found a very excited and vocal audience, it sort of dawned on me that it would be nice to really think out a nice ending that would wrap our run. To really stick the landing. It's very rare for creators to have a chance to plan an exit long in advance. Usually a book gets cancelled prematurely or the creators pulled from a book with very little time to wrap things up to their satisfaction. So as we went along, I know I was always nervous about wanting to find out exactly when we'd finish. Was it going to be the original 12 stories, the expanded upon 24, or even possibly more after that? I wanted to have a story in the bag so when the time came, we could present it as the last one. I don't know where I came up with the idea for having a family album look back, but it just felt appropriate. Li'l Gotham's cast actually grew very big over the year. Lots of friends and family for the Bats, as well as villains. And trying to fit in everything and everyone for a final bow would be a crazy task. At one point, we toyed with the idea of doing a 2-part Christmas story. Sort of a Batman ghost of Christmas Past, Present, and Future. What life in Gotham might be like if Batman wasn't in it. So Bruce would be visited by an early version of himself as Batman (or possibly the Grey Ghost), a current version of Batman, as well as a trip into the future with Batman Beyond. Dustin and I even toyed with having our idealized version of the future. 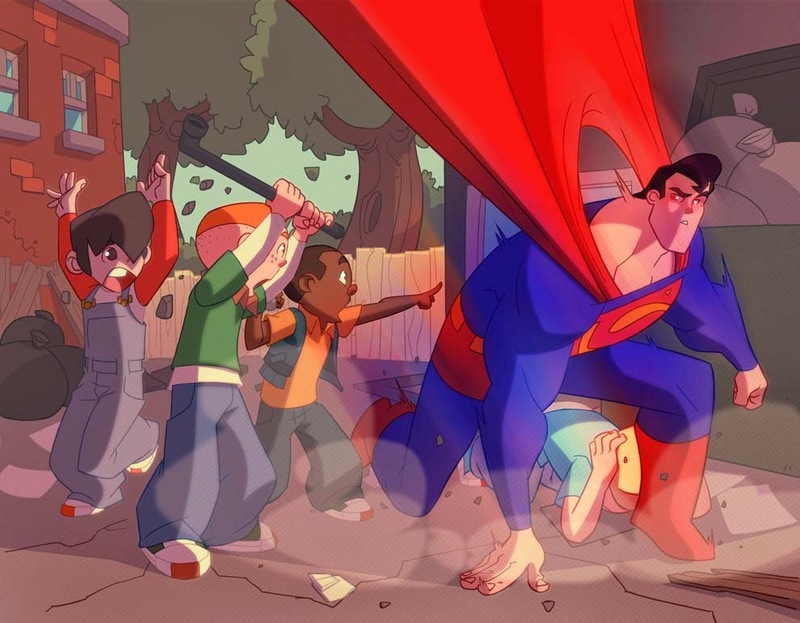 Superman and Old Bruce with kids carrying on the tradition. Have a brighter outlook than the darkness that permeates most of the current books. But as things got closer to Li'l Gotham finishing, we were running out of room with stories we'd already committed to. So we decided on just doing one 10 page story to wrap things up. And the family album concept would be a nice visual treat to look back on all the characters fondly. And of course, give me one more chance to toss in a song by rewriting the "12 Days Of Christmas" Li'l Gotham style. 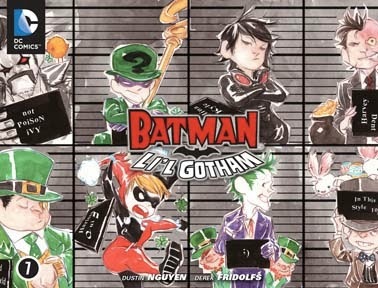 While finished, Li'l Gotham remains firmly on my mind with a smile. A chance to continue the collaboration with Dustin and see his vision of this project finally become a reality after taking years to get it greenlit. It helped open a lot of creative doors for me being associated with it. And it's just nice to have something I've worked on be so easily accessible to kids of all ages. I think the trick to how our book worked, was Dustin and I were just having a lot of fun. I don't think I ever thought of trying to write to fit a certain age bracket. I kind of just approached it with the mindset of the animated series with a lighthearted angle to it. To write something I'd enjoy reading. And I think the darker the main books got, the easier it was to go the opposite way and shine a light on the silly absurdity of these characters. But always in good fun. So what does the future hold? 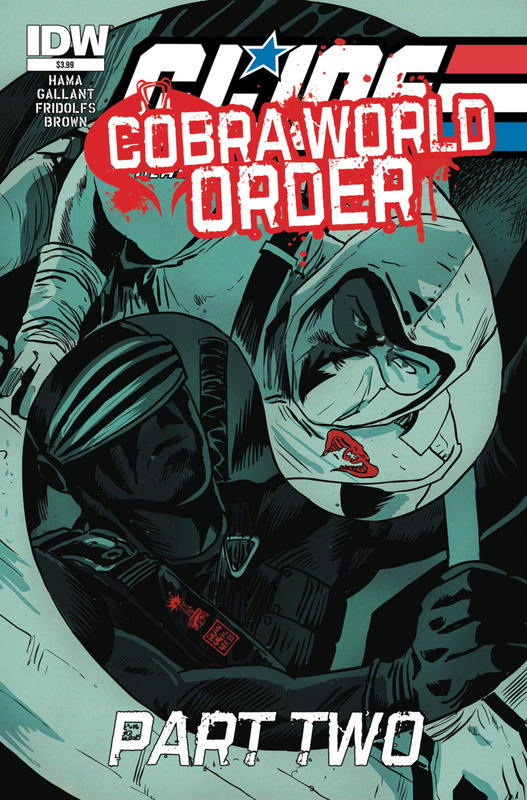 Our first trade paperback collection is hitting stores, so all these stories will eventually be collected. I think the sales of these can help determine if there's enough demand to bring back the series. 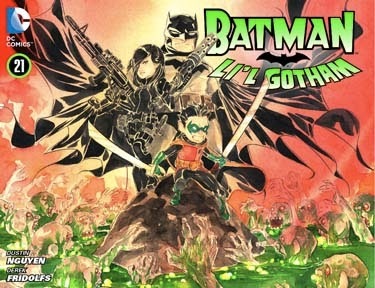 And we're going to get some Li'l Gotham action figures coming out this year as well. 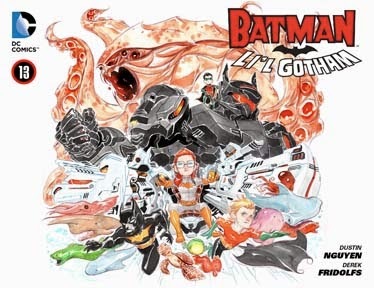 And hopefully those do well enough to continue past the initial four being offered (I totally wanna get a Li'l Gotham Mr. Freeze…make it happen)! Out of the Li'l city and back into the big city again. SAINT PATRICK'S DAY (digital issue #7) = Some of the stories based around the holidays were pretty easy to pair up with certain villains. Anything winter would go to Mr.Freeze. Thanksgiving has a turkey so any bird related stories could have Penguin. With this one, all I could think of was the color green for the holiday, and Riddler wears green. Sometimes it's as simple as that. Now Riddler, as I'm sure most writers and fans would say, is probably one of the toughest characters to write stories for. He's a genius, so already he's smarter than…well…all of us. And trying to work in the riddle or puzzle aspect to his crimes can also rack the brain trying to come up with something. But this was a fun one to have Batman go detective trying to solve the crimes, and get a chance to see a lot of the heroes and villains. Having old-school Lobo in this (my favorite version of the character) was from me. And the large backseat in the batmobile gag…pure Dustin. What I'll remember most about this story is Dustin drawing pages in the hotel at Seattle's Emerald City Con. We were already putting out two stories a month, and with no time to spare, he would be at the convention all day, and in the hotel drawing these all night. Not enough gets said for his commitment putting out a monthly painted book. It's not easily done. EASTER (digital issue #8) = I think this one came about because of the white rabbit being associated with both Alice In Wonderland and Easter. So it would be a Mad Hatter story by default. I was always looking for ways to make these stories fun for Dustin to draw (and for me and the readers to see), so having stuff like the pixelated video game Damian was playing were things always being added in. Same with different art styles and color schemes that would come into play in later stories. 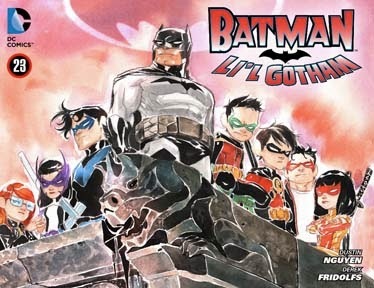 Having Damian tackle the Easter Bunny and fight off mind controlled zombunny kids…just your normal type stuff we'd giggle putting into these stories. And even though it's implied that Hatter ate the egg bomb at the end of the story, I always felt they were playing a joke on him and he didn't really eat it. The bomb's ticking sound was all in his mind. We'd always try to skirt the line between implied or fun fights and not gory violence. APRIL SHOWERS (digital issue #9) = This was always intended to be a 2-part story. 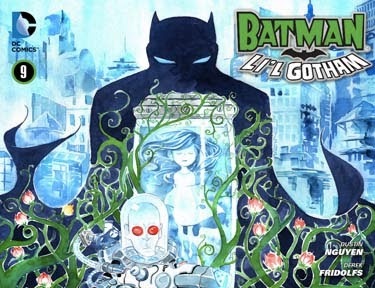 "April Showers" being the first part with Mr.Freeze, and the follow up issue would be "May Flowers" with Poison Ivy in an overgrown Gotham from the rain and the plants. What we didn't see coming was Dustin just being overworked with the schedule never allowing time for him to breathe once we started doing two stories a month. So we ended up having a break so he could get caught up, but we'd lose one of the stories this month. 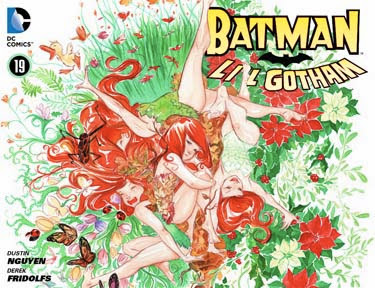 So the 2-parter got shortened to 1 issue, which is why Ivy's release from Arkham and quick re-arrest only hinted at what the second issue would've been. One of the aspects I loved most about writing Li'l Gotham was being able to write in familiar nursery rhymes and songs, but adjust them to fit in the story. I got one in here and in other issues as well. Mr.Freeze is probably my favorite Batman villain. Forever always our Charlie Brown in Li'l Gotham, with good intentions but never getting what he wants. And the thank you card at the end of the story, I believe, was drawn in crayon by Dustin's daughter. CINCO DE MADNESS (digital issue #10) = This issue was spearheaded by Dustin. When we could, we'd sort of divide up stories. He ran with this one and I came in for any additional dialogue or scenes after he finished his first draft. I know Dustin always liked the idea of a Gotham Boys & Girls Club, having a chance to draw Damian, Colin, Tim and the others. The younger kids away from the adults. So this was their chance to shine. Stuff like the scrabble game and taco challenge, again…pure Dustin. MOTHER'S DAY MANIA (digital issue #11) = We begin with a Paul Dini cameo. Dustin and I loved working with him on Detective and Streets Of Gotham, and it felt like a fun nod he'd be in a scene in an issue with his creations (Harley Quinn and Colin Wilkes "Abuse"). I apologize for the bad pun dialogue I gave him. The more we wrote these issues, the more we wanted to keep putting Damian in them. He's a good obnoxious comedy foil for anyone around him. And I admit, I patterned a lot of him after me (right down to his favorite sandwich from a previous issue, choice of pizza toppings in this one, and that I played the trumpet throughout high school and college). It was very easy to vicariously write through him. Most don't know this, but had we continued to work on Streets Of Gotham if it didn't get cancelled, Dini was planning on doing more with Abuse. Including him having his own costume that would be a unique design variation on Batman. Which is why I thought it would be fun to have that show up in this story when he changes into the new costume. I grew to really love doing this sentimental stories. There's really no space for them in current darker books, but we found they fit perfectly in our Li'l universe. FATHER'S DAY FUN (digital issue #12) = You can't have a Mother's Day without a Father's Day, so this was sort of a paired two-part story. My original influence for this was the episode of Seinfeld where they couldn't get a table at the Chinese restaurant. With that in mind, I thought putting the two opposing families on opposite sides of the same table would lead to some fun heated dialogue. I think having all the boys cooking for Alfred in the kitchen was Dustin's idea. So goofy yet perfectly fitting for this type of story. MINAZUKI (digital issue #13) = For the longest time, Dustin wanted to write and draw this issue. The ocean provides for a very colorful visual with all the sea life and Aquaman. That it happened to have giant robots fighting monsters at the same time that Pacific Rim came out, wasn't intentional but a fun coincidence (as we had pitched this story a long time back). I think I was always aware for us not to fall into having a lot of guest staring stories (but cameos yes). 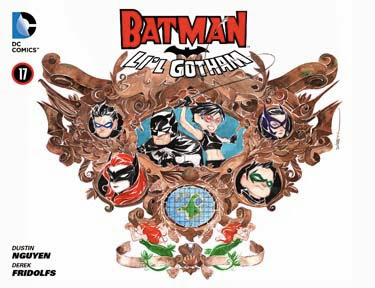 I think I wanted to keep the brand very focused on Batman and his family of characters, and I didn't think it would be ideal for it to turn into a Brave And The Bold or JLA book. Especially since there was some thought at one time about doing a separate title with the rest of the DC characters. Still, this was a fun one to do. INDEPENDENCE DAY (digital issue #14) = I think out of all the stories we did, this one we had the least idea about. When we pitched a year's worth of stories, before it doubled up, we picked out all the main holidays with loose descriptions of what they'd be about. I think we left this one pretty vague in the pitch about bbqs, beach, and fireworks. So when it came time to write it, it was a bit slapdash trying to figure out what the story would be. I think as the stories continued along, I got tired of seeing the same villains in every story. That it would help to space them out so characters wouldn't reappear so often. And also have a chance to rotate in lesser known characters…which is why we get a chance to have Roxy Rocket, Firefly, and Solomon Grundy. Also I'm guilty of these stories being very villain focused. They're so much fun to write, that sometimes it was easy to forget to put Batman and the good guys in them. The "Batdad" line, was sort of my influence of the tv show Alias, where it was very common for Victor Garber's character to be nicknamed "Spydaddy". GOTHAM COMICCON (digital issue #15) = This was another idea that Dustin had very early in our pitch. To do a story to come out around San Diego Comicon (perfect cross promotion). And Gotham's version of that would poke fun at so many of the things we've experienced in the years going to that show (I can't believe I've gone to San Diego Con 19 years in a row…you see a lot in that amount of time). It would provide a chance for us to actually cameo in our own comic. 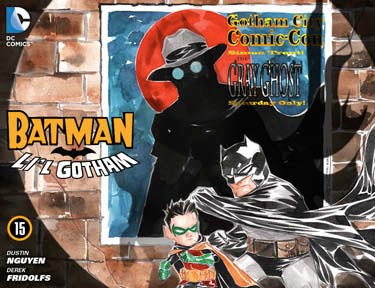 A chance to have the Grey Ghost show up briefly (no surprise that Li'l Gotham is heavily influenced by Batman: TAS). And ultimately a chance to make a statement and begin the healing process of how fans feel towards comics. We all have favorite characters, creators, and runs. And whenever they stop, we're disappointed, saddened, and angered. But our story would be a reminder that just because the version you like isn't happening; that you shouldn't let that stop you from enjoying those old stories. TROPICAL GETAWAY (digital issue #16) = Finally we'd have a chance to do a real 2-part story. In the first part we'd have Batman and Catwoman off on their pirate adventure, and the second part would see what the rest of the heroes and villains did while they were away. And anytime Dustin gets to design a new Batman uniform, he always jumps at the chance. This one turned into a bit of an Iron Man (Iron Bat?) design, with the uniform in the suitcase and boot jets. Sort of like Batman Beyond as well. BIRD WATCHING (digital issue #17) = With Batman away, it was up to the rest of the heroes to band together. I know originally, Dustin and I just thought of this story as having all the different Robins get together in their clubhouse to protect Gotham. But with so many of the heroes having a bird theme (Birds Of Prey, Hawk & Dove), it was fun to extend the cast in this one. Same goes for the underused villains. This story was top heavy and out of control with the cast of characters, and I'm guilty of packing it with as many as I could think of just to see Dustin draw them. I always liked Penguin's Iceberg Lounge, and wanted to feature it more in one of these stories. And having the heroes arrive as part of the jazzy swing band seemed a great visual (I didn't even realize the Birds Of Prey already had appeared as singers in an episode of The Brave And The Bold, so this ended up being an unintentional nod). LABOR DAY (digital issue #18) = I think no one loves the Carpenter more than Paul Dini, Dustin, and I. Created by Paul in Detective Comics and Streets Of Gotham, I always love these sort of fun quirky characters. I also felt this story might be a risk having it center around her, even if the holiday matched up perfectly. She's not as known as many of the villains. But it gave me a chance to show all the villains that she's worked with building their hideouts. It has a very children's book quality to the gag and payoff through the issue, as she's constantly interrupted on the phone. And fun to see Dustin once again, draw a range of characters. I thought it would be fun to give her a Boston Terrier, which is the same type of dog that Paul and his wife own. Hush finally made a longer appearance here to do a riff on the "Who's On First?" gag. IVY IN THE FALL (digital issue #19) = Another of the stories that Dustin was clamoring to write and paint. Ivy is his favorite character and this became a tour-de-force for his art. To show her in different seasons. Probably the most beautifully painted story he did on our run. We also always liked the Gotham City Sirens, so any time we could do stories that had the three of them together, we'd jump at. This story I probably had the least amount to do. The draft that Dustin provided was so pitch perfect, aside from maybe any grammar corrections or some added dialogue, it was good to go. HORROR STORIES (digital issue #20) = This was another one that Dustin headlined. And one that actually caught me by surprise. I didn't know he had planned to paint all of the kids' separate ghost stories in a different style. It really made the whole thing very special. I know as it got closer for this story to be worked on, the original idea was to see if we could have Scooby Doo and the gang in there, either as part of the story or even a short cameo with the Mystery Machine in the background. But I think they're so particular on how those characters look and are portrayed (needing to be almost animation on-model all the time), that it was decided against using them here. Also I think since they were going to have Batman & Robin crossover with Scooby in another comic, it might be confusing or steal that thunder. Regardless, this was a ton of fun to work on, as we really played up their exaggerated horror stories. ALL SAINTS DAY (digital issue #21) = Since we were now getting close to our full year on the book, we didn't want to fall into the habit of revisiting the same holidays over again. So technically while still a spooky issue, this isn't Halloween but All Saints Day. And keeping with that religious theme, it seemed one of the perfect places to have Azrael show up. Also I think after the nice unexpected reception to Damian's family Halloween (of fighting off reanimated corpses from the Lazarus Pit in issue #1), I was looking to do a much longer zombie story. And I'm such a fan of Talia and Ra's it made for one of the more offbeat shared custody holidays in the comic. I wasn't sure if my playful dig at the New52 being Damian's dehydrated hallucination would fly…but it was all in good fun. Same goes for the 1-900 Kill Robin death call joke (Dustin has a morbid sense of humor…which I fully endorse and enable). TIME TROUBLE (digital issue #22) = The Clock King is another one of my favorite villains during his time in Batman: The Animated Series. He rarely gets used in comics but doing a Daylight Savings Time story was the perfect excuse for him here. Also maybe a little too late in our run, I was feeling that Batman wasn't getting as much time in our stories. So I thought here was a chance to not have him partnered up with anyone other than…himself. Lots of Batmen. A fun way to use various Elseworlds versions of the characters (or entirely new like Fruit Batman). I know had we done another year of stories, Dustin and I would've gotten around to doing some in the future with Batman Beyond. Instead, we had to find a way to fit in Old Bruce and Terry near the end of our run. WHEW!!! That's all of them…or almost all of them. 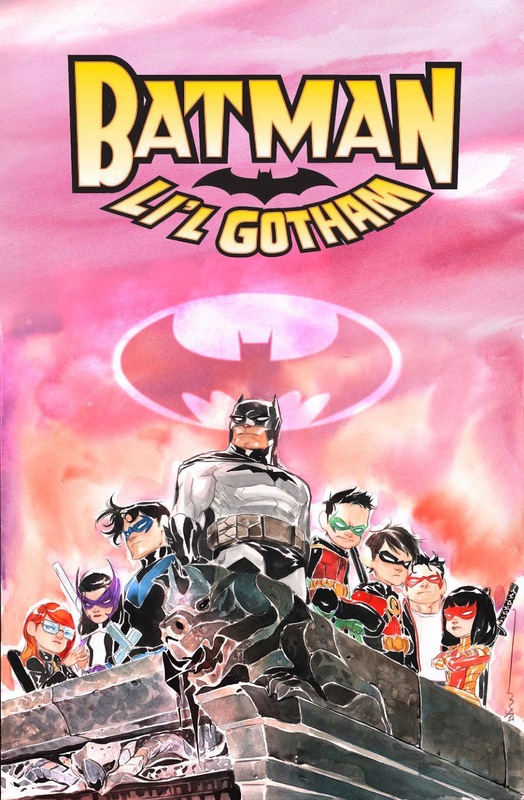 Our very last issue of Li'l Gotham goes on sale digitally tomorrow. And I'll be back with my final thoughts after that.